Presented by Campbelltown Arts Centre and The Veiqia Project, join us for a full day of delicious lovo-making (Fijian earth oven), workshops and talanoa to celebrate the last 18 months of cross-generational Era Yalovata Na Marama program. 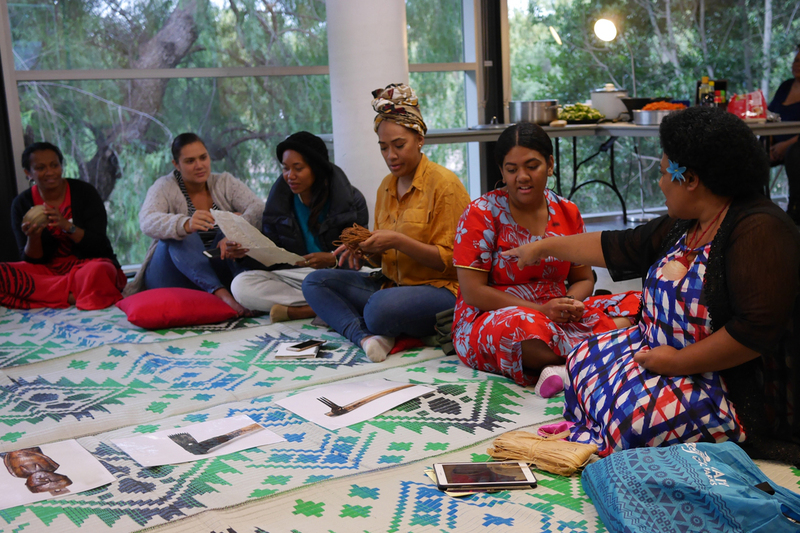 Led by The Veiqia Project, iTaukei women* from Western Sydney have gone on a journey of cultural and artistic discovery. This day is a chance to share knowledge and celebrate culture with the wider Pasifika community^. The Veiqia Project is inspired by the traditional practice of Fijian female tattooing and uses exhibitions, research findings and workshops to invite Fijian (and other Indigenous) women to take a journey of artistic and cultural discovery. This is a free event for the Pasifika community and their friends. For any enquiries please contact Jessica Olivieri 02 4645 4100. This program is funded by the Australia Council for the Arts and Creative New Zealand. In Spring 2019 iTaukei (First Nations Fijian) women take over Campbelltown Arts Centre with an exhibition titled Marama Dina.